We will now resume our past-promised post on CocoaConf. 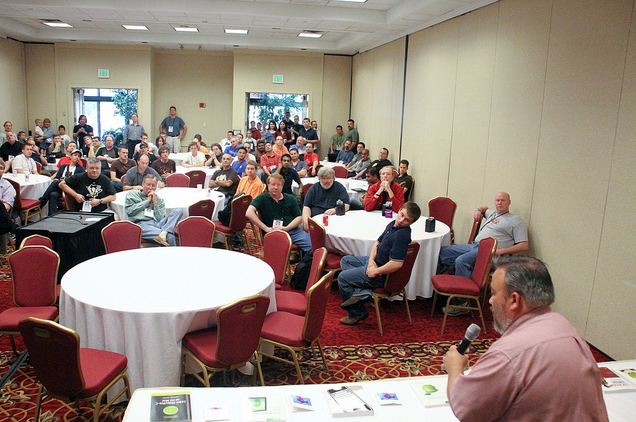 Part of our motivation for resuming is the impending arrival of CocoaConf Raleigh, which is coming up in December. We figured we didn't want to start doing a wrap-up of that one before this one's wrap-up is done. So, here we go! Upon our arrival, we utilized the special CocoaConf entrance. We turned down the gracious offer of help from the conference center staff, as we have lots of experience in hauling, and we have a system all worked out. We provided special Joshie-sized boxes for Joshie's capabilities. As you can see, sock matching is a skill foundational to many higher-level tasks. Our experienced venue staff made set-up a breeze. Joshie found the accommodations satisfactory. He was okay with the lack of sippy cups, though he found it a bit odd. Sarah sorts the official CocoaConf t-shirts. We didn't have to remind the children to smile. Susanna headed up the team of feedback gatherers. Attendees were given forms to fill out for each session, and earned a “CocoaBuck” for each form handed in. CocoaBucks were one of Daddy’s ingenious ideas. 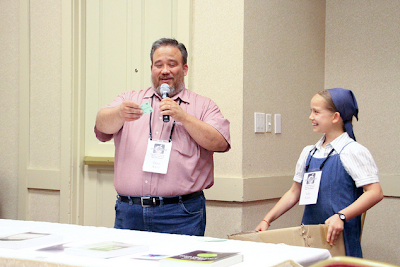 We had a high rate of response, and then the CocoaBucks were entered in a drawing for prizes at the end of the conference. 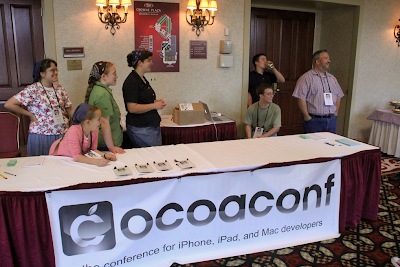 Finally, the day dawned on our first CocoaConf! With great anticipation, we awaited the attendees who flocked to Dublin, Ohio... because we put on a conference?????!!!! We concealed our amazement as people actually put on the name tags that we made at home! Checking out the program for the weekend's schedule. Tad Lamb (on the right of Dave) was our host in Columbus for several nights of fellowship. We tracked down his homeschool website and saw it as a means for local advertising for the homeschool discount we were offering to CocoaConf registrants. Through that contact, we were able to communicate with him and let him know what our family was doing, and he graciously invited our whole family to his home while we were in town! Sleep makes him very irritable: Daddy had a late night (picking up a key speaker from a late flight) and an early morning (hosting an optional time of prayer before the conference started). However, adrenaline kicked in. There were few opening hitches, and things got underway, praise the LORD! Hitches were actually pretty minimal. Who could resist taking a sec to fill out a feedback form delivered this sweetly?! Noah tries to evade our official CocoaConf Columbus photographer, Mr. Ed Crockett! The CocoaBucks were soon ripe for picking, as the close of the conference arrived. A call was made for Daddy to have Susanna do the official CocoaBuck picking, and we agreed that a more appropriate picker could not be found. Her face turned as red as an apple as she approached the front of the room. We were left with a lot of good feedback, a good stash of free ball-point hotel pens and tablets, and enough carbonated sodas to get us to Cupertino and back. 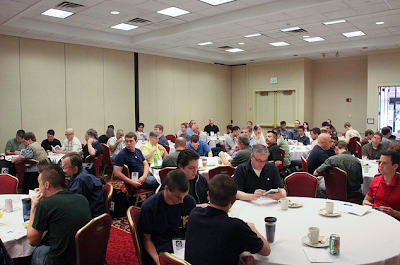 The response to this family-produced conference was overwhelmingly positive. A few asked if we were Amish, but we put those thoughts to rest with the high per-capita of iOS devices on board. We finished packing up, and Daddy and Solomon hosted a special dinner for the speakers that didn’t have to leave early. The rest of us headed off with the Lamb and Auer families for a pizza treat at a nearby park. Both homeschooling dads, Tad and Ken Auer enjoyed getting to meet and chat. Ken's classic programming book, a well-paged volume at our house, was the inspiration for Zak's insistence on melamine walls when he finished Dave's home office in Wisconsin. We knew from reading the dedication and acknowledgments in that book that he was a believer, and it was really an honor to have his family come out and join us. Joshua Auer and Sammy consume pizza. The pre-Dutch-Blitz photo of the girls. When feeding Kleins, you can't go wrong with pizza. Thanks so much, Auers!! We had such a good time visiting (while waiting for pizza) that we didn't discover the trail and creek soon enough! We really enjoyed a break from the brutal St. Louis summer. It was just delightful weather in Columbus. Cool, shallow water flowing over flat rocks! Enjoying new friends.... the post-Dutch-Blitz photo. Everyone except for Daddy and Solomon with the Lambs and the Auers. We enjoyed a couple more nights at the Lambs’ estate and embarked on the now-traditional, post-CocoaConf trip to the Creation Museum together. It was a fun, exhausting time! Our return trip home was marked by an unplanned four-hour stop on the side of the road due to a clogged fuel filter. We failed to remember the lesson we learned in Mexico: always keep a spare in your vehicle... even if it’s a bus... especially if it’s a bus! We learned our le$$on, a$ a friendly road$ide repair guy fetched one for u$. We have many fond memories and much for which to give thanks as we count down the days to CocoaConf Raleigh!! The 7 Wonders Science Center!